NGC 5395 and 5394 are two interacting galaxies in the constellation of Canes Venatici. NGC 5395 is the larger galaxy, and NGC 5394 is the smaller galaxy at the top. NGC 5394 is believed to have cart wheeled through NGC 5395. 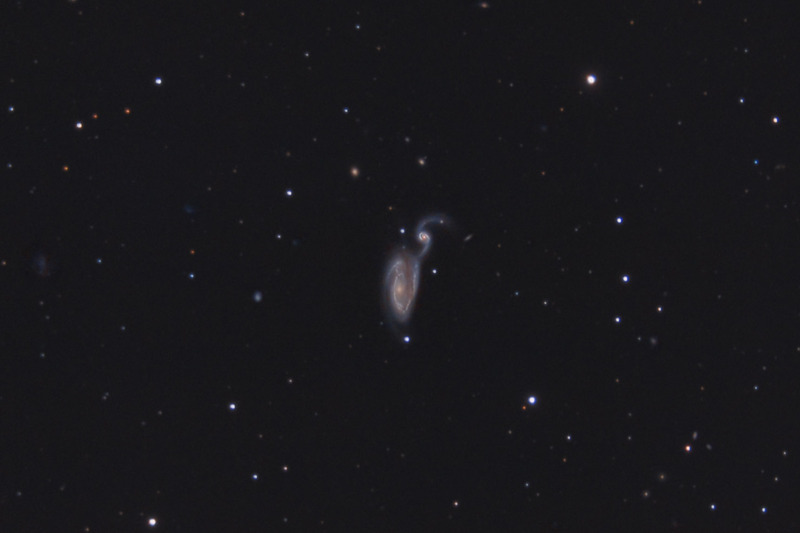 Also known as Arp 84, the two galaxies bear a striking resemblance to a blue heron. At a distance of 165 million light years, the galaxies appear quite small in our skies - subtending an angle of only 2.7 x 1.3 arc minutes. Close inspection of the image will reveal a number of faint background galaxies. Notes While this is a fascinating combination of galaxies, it turned out to be rather challenging for me to capture with my C-8. The galaxies are quite small, and the details are very fine. I'm happy with the details I was able to capture, but these beautiful galaxies really demand a more capable telescope to capture the intricacies of their interaction.